PierceCare is located in Connecticut’s “Quiet Corner” in the historic northeastern Connecticut town of Brooklyn. Creamery Brook is at the junction of Route 169 and 205. Route 169 is a designated National Scenic Byway and has been described as one of the Top 10 most beautiful roads in the country by Scenic America. Come visit and you’ll find Brooklyn is the ideal location for convenience and quality of life. 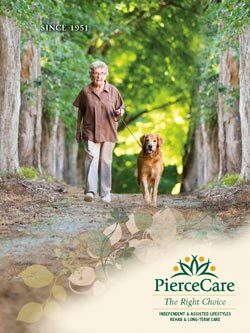 Rich in history and scenic beauty, PierceCare is only minutes away from Interstate 395, Routes 6 and 169. Our location provides easy access to Providence, Worcester, Boston, Hartford, the Connecticut Shore, and all that New England has to offer.